This baked brie recipe is easy to make and the easiest to eat! 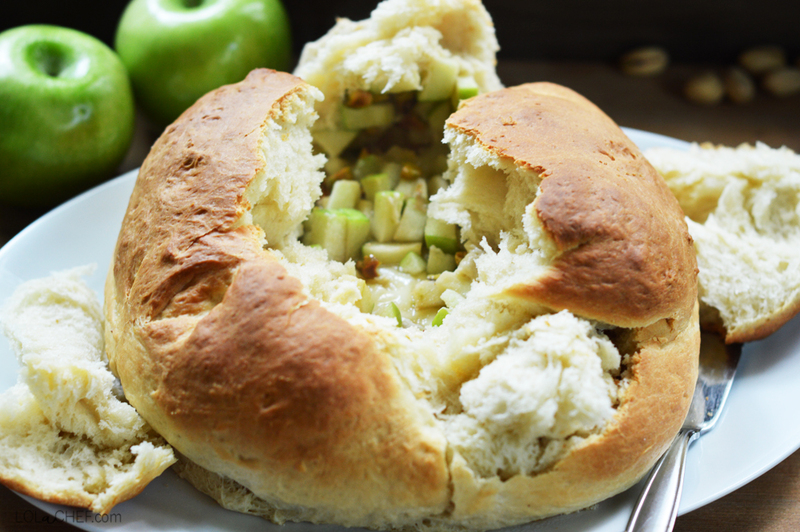 It’s baked in it’s own bread so all you do is pull apart and devour…simple right?!? I tried brie cheese for the first time a couple years ago at a friends house. I was skeptical at first since I have a love/hate relationship with cheese. The moment I tried it was similar to one of those movie scenes where people are running to each other on the beach…..where have you been my whole life?!? Cue record scratch…this is reality. If you are not familiar with Brie, it is a soft cheese that is covered in a white rind. When a baked brie is warmed you can eat the melted center spread onto a cracker or bread of some sort. It can be eaten cold, I’ve had brie cheese sliced on a sandwich…very good. Most of the time when enjoying as an appetizer it can be a little to tricky to get out of the rind. A lot of work and possible mess for one bite. Since it is so easy and delicious it’s one of my go-to appetizers, did I mention it pairs well with wine? The first time I tried making one, I placed all ingredients onto the top of the cheese with white rind intact. It was okay, but I felt there could be a better way. I started to slice off the top of the white rind, placed toppings on the cheese itself and then bake it. It seemed a lot easier and more enjoyable to scoop and eat. In the spirit of fall and soup in a bread bowl, I decided to try to bake the brie in bread dough. If I could cut off the top I could remove all the rind and let it bake in fresh bread. I imagined it would melt the brie while cooking the bread and perfectly warm the added ingredients all together. Yup, it did. I used green apples for the flavor balance and like how the colors match…just sayin! I baked this on a pizza stone, and it turned out wonderful. Simply roll out the dough, cut all the rind off the brie, then place in the middle of the dough. 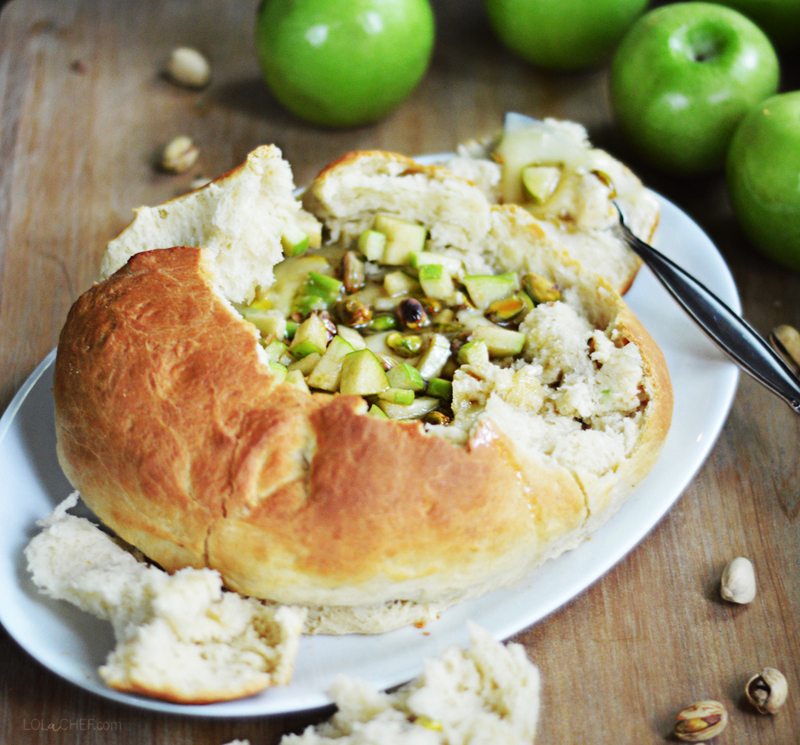 Add honey, apples and pistachios, then bring all the sides up to cover it up. If you don’t have time to make your own dough, you can find frozen bread dough in the freezer section of your local grocery store. Or, you can make ahead and freeze your own. Place cheese (minus the rind) onto the dough. 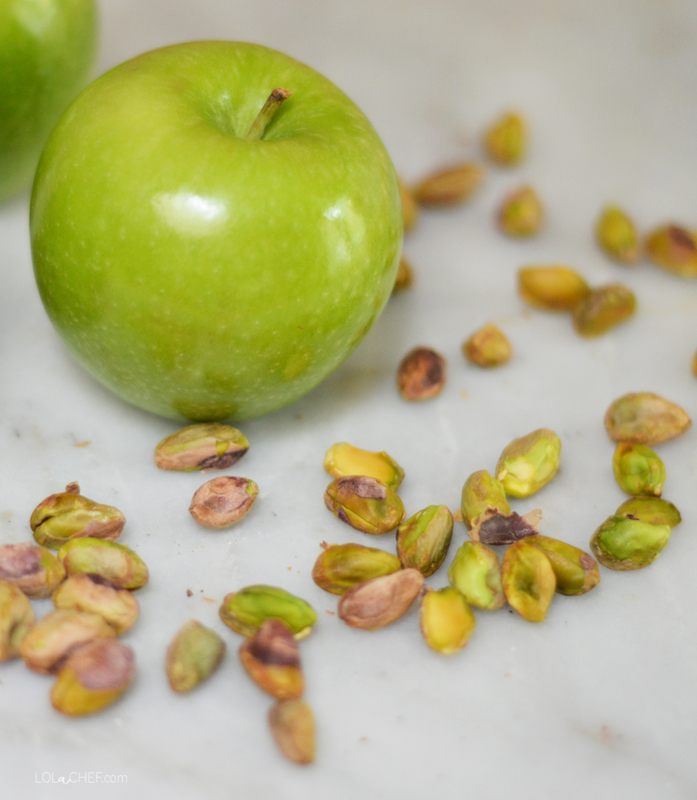 Drizzle honey, add sliced apples and pistachios, drizzle the rest of the honey. Then, roll the edges of the dough onto the top and seal any holes or breaks. As you can see here there is a tiny opening near the bottom, I pinched it before baking. When it is done and golden brown on top, take it out of the oven and pull a piece off the top and it should look something like this. Preheat oven to 350 degrees. 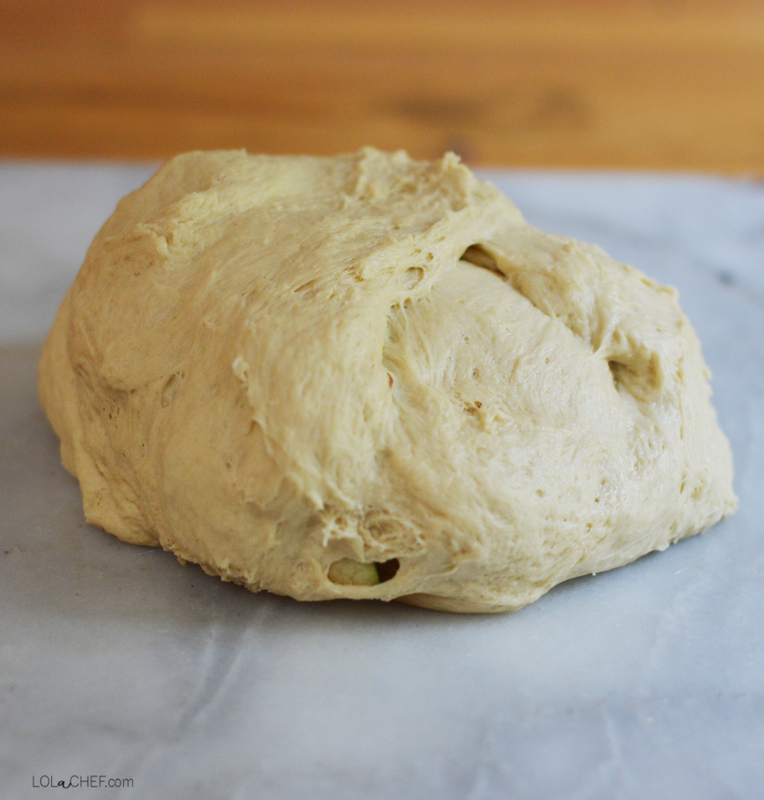 Spread bread dough onto pizza stone or desired pan. Remove the white outer rind of the brie cheese. 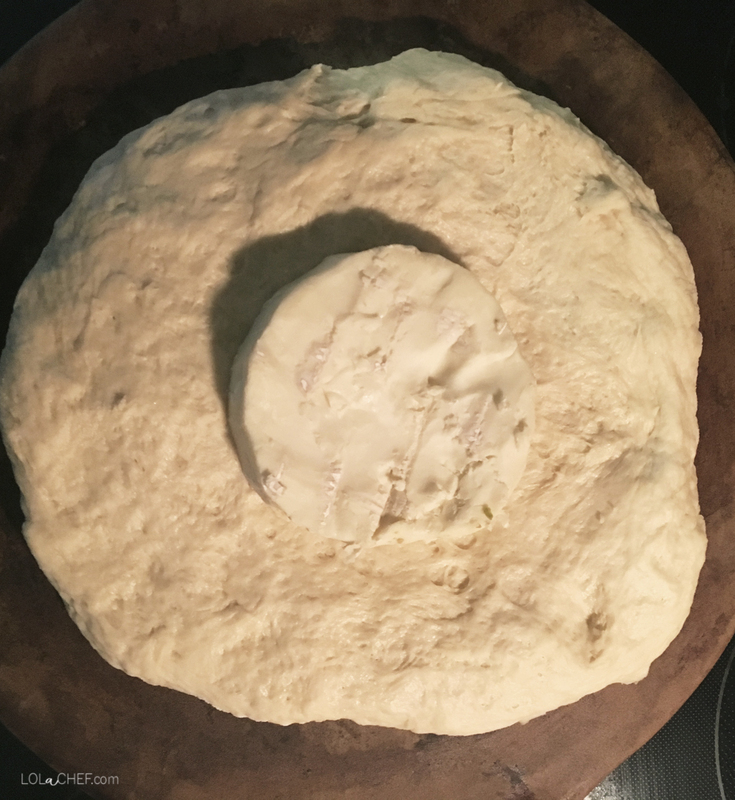 Place the Brie cheese in the center of the bread dough. drizzle with 1 tbsp honey, add apples and pistschios and drizzle the rest of the honey on top. 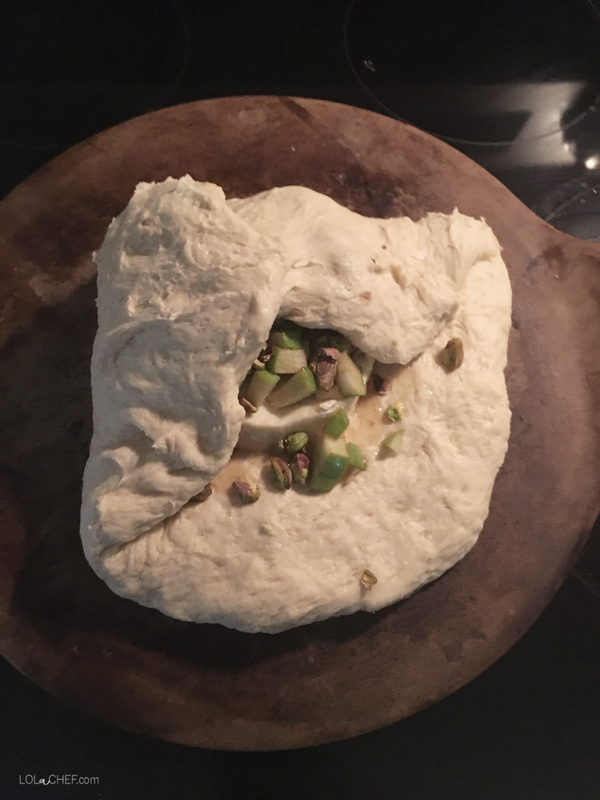 Fold the edges of the dough ono the top and seal shut. Make sure all edges of the dough are sealed. Place in oven for 25-30 minutes. The top of the bread should be golden brown. I cooked this bread until very golden brown, the crispy crust helped scoop the cheese :)Enjoy! *this post contains affiliate link for helpful products that I recommend.